The MJX B2W SE is a similar design to Altair Aerial’s Outlaw but comes with some great updates. 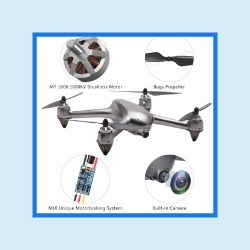 Its GPS and smart flight modes are good for beginners and more experienced pilots will be able to enjoy the MJX B2W SE’s notable camera features and long-range flying. If you loved Altair Aerial’s Outlaw, the MJX B2W SE is a great upgrade for a great price. The assembly is simple when you follow the initial setup instructions. Be sure to charge the battery and calibrate the aircraft before taking flight for the first time. If you’ve ever used a GPS drone calibration should be familiar to you. However, you will need to calibrate before every use. Luckily, the manual is easy to follow which makes it simple for beginners or anyone getting started with the MJX B2W SE. The MJX B2W SE has many features you should get to know before you take it to the air. Like the Outlaw, the built-in GPS remains one of the star features of the MJX B2W SE. Its accuracy is unmatched as it hovers and moves precisely. The GPS on the MJX B2W SE adds functionality because once it is in the air, it will stabilize itself automatically. This makes it fairly easy for beginner pilots to fly. Take a look at our Best Drones with GPS review article here! The MJX B2W SE has an insane amount of intelligence. Like the Outlaw, there are Return-to-Home (RTH) features in this addition. If there is a GPS connection, the drone will be able to fly back to the point it took of from with just the push of a button. 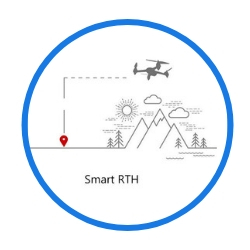 There are three types of RTH that are designed to protect the MJX B2W SE in case it loses connection or if the battery begins to die. The drone will slowly descend This feature is great for beginners just learning to fly their drones. Another brilliant feature that the MJX B2W SE offers is the smart remote control alarm function. If your drone is ever in low voltage, or if your signal is weak, your remote will transmit a beeping sound so that your drone can stay in control and that your flight is safe. This added feature is again fantastic for beginners who are just starting to learn how to fly. If taking stunning photo and video is your thing, you will love taking advantage of the GPS features in the MJX B2W SE as it makes capturing footage so easy even if you don’t have a ton of experience with aerial photography. The GPS and high-quality camera work hand in hand for an amazing flying experience. The camera is 1080p with 5G wifi and you can record with the drone’s micro SD card or use your phone’s memory. There is much more included with this drone that makes it something to rave about. The battery life on the MJX B2W SE lets you stay in the air for approximately sixteen minutes. Along with that, the drone has 500-600 meters of control range. With the amount of time and space that the MJX B2W SE allows for, it makes it a great drone for exploring and learning. Just be sure that the battery is fully charged before use and that you calibrate the drone with GPS before taking flight. With that, you’ll be good to go on letting your drone soar through the air. Beginner pilots, you are going to want to get your hands on this drone. MJX continues to release great products for a variety of skill sets. The MJX B2W SE seems to be ideal for anyone who is just starting to fly. There is unmatched control that comes with this drone because of its accurate GPS and Return-to-Home features. It is an amazing steal being able to purchase such a solid beginner drone for less than $300. Especially for the number of features you are receiving when you buy this drone. Plus, it’s long battery life will you keep you flying and improving your flying skills. There are no major issues with this drone just a few small inconveniences. The drone is only compatible with 5G wifi phones and it needs to be calibrated every time before using. Overall, buy this drone if you are just starting out with flying. More experienced pilots may not feel challenged with all the beginner-friendly components in the MJX B2W SE, but they’ll be surprised with how many great features come with this reasonably priced drone. The sleek look and quadcopter model of the MJX B2W SE could still be a great addition to your drone collection for days you want more relaxed flying. ← What does it take to start your own drone business?